Wednesday, November 18, 6:00 p.m. 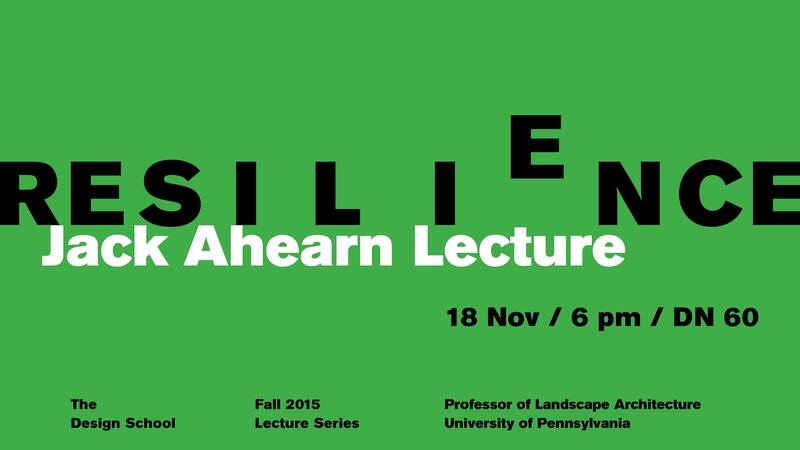 Professor of Landscape Architecture at University of Massachusetts Amherst Jack Ahern visits the ASU Design School, as part of ongoing their Lecture Series. Globally, policy makers, scientists and design professionals accept the new reality that the battle for sustainability will be won or lost in cities – and also that cities need to build a capacity for resilience. Paradoxically, the expectations for unprecedented development of urban development also represent a novel opportunity to practice an adaptive urban design – to “learn-by-doing”. A model for “safe to fail” adaptive urban design is proposed to provide a structure to integrate science, professional practice, and stakeholder participation to support urban sustainability and to build resilience capacity. The model features: 5 resilience strategies, experimental design guidelines, and monitoring and assessment protocols. The “safe-to-fail” adaptive design model encourages and rewards innovation in a low-risk, safe-to-fail context. Precedent studies will illustrate the application of the model across a range of urban scales and contexts. Jack Ahern is a landscape architect who focuses his research on the application of landscape ecological theories, principles and methods on landscape planning and design projects. Earlier, he worked on broad-scale integrated systems of protected lands known as greenways – linking their spatial configuration and resource base with ecosystem services and human use(s). His books address multiple aspects of this applied research including: Water-Centric Sustainable Communities (2010), Measuring Landscapes: A Planner’s Handbook (2006), Biodiversity Planning and Design: Sustainable Practices (2006), Greenways as Strategic Landscape Planning: Theory and Application; A Guide to the Landscape Architecture of Boston; and Greenways: the Beginning of an International Movement (1995). Ahern’s current research is focused on applied ecologically-based planning and design of urban environments for sustainability and resilience. This work continues to engage landscape ecology as a theoretical platform to integrate the emerging, fine-scaled professional practices of green infrastructure and landscape urbanism across scales to form green urban networks linked with ecosystem services, sustainability and to build resilience capacity.